So, as a stay at home mom there are always a million things to do. Manage four kids, manage the house, cook, drive little people around…you get the picture. I need to tell you about my day and how I honestly felt true joy as I attended to the tasks of the day. Take a look. *I did 5 loads of laundry. That means that God has provided my family with clothing. *I did 3 loads of dishes. That means God has provided my family with an abundance of food. *I dusted. That means God has provided a home for my family. *I cleaned up mud from the floor. That means God gave us a warm day and a safe place for my kids to run around and play. Do you see where I am going? We get so weighed down by the day-to-day that we forget to see what we have been given. Our lives are so richly blessed and we so often forget to give God the glory for the everyday stuff. We are quick to praise Him when something big happens but what would it be like if we praised him for the stuff we take for granted. I am thankful that my eyes were open today. However, my heart breaks for those without. Tonight, I feel compelled to pray for those in need. That they would know they are loved. Would you join me in prayer tonight? Before you fall asleep, would you just ask God to fill their hearts with comfort and love. Oh, and don’t forget to thank God for all He has given you! This month, Abby turned one year old. During that time, our posts have been few and far between. Have you noticed? We went through droughts with nothing to say during our adoption process, usually when there wasn’t much happening. But this time is different. Several weeks ago, Kristi and I started talking about the blog. How great of an experience it was and how amazed we were by the comments and hits we received. This story was really told for the child we had not met yet, as well as our children who were living the experience. We aren’t good scrapbookers and videographers. And we quickly forget many of the good tales of parenthood as the years crash by. This was our way of capturing the experience. But the more we talked about what to post next, the more we realized that Adding to the Family was finished. We are there now. We are a family. She is part of us and we are part of her, and now our stories are all wrapped up together. Sure, we will have (and already are having) expriences unique to adoptive families. Everything from hair products to birth order issues to cultural celebrations to new support networks. But we feel that those are different stories, ones that we will leave to others to share. So this will be our last significant blog post. The last chapter. The swan song. Let us use this opportunity to update you on Abby. It’s no longer a baby announcement, but the introduction of our daughter. In the first few months with us, she quickly moved from the 10th percentile in height and weight to the 40th in height and 80th in weight. Now she is up to the between 75th and 85th in these categories – on track to match her big American siblings. She loves her bottles, is experimenting with big people food, and has eaten lots and lots of the little “puffs” that she picks up and rolls around with her little pincer fingers. Speaking of puffy, her hair has gotten bigger and rounder, but still so soft that it’s hard not to touch. It takes a lot of care, but even she likes to bury a couple of fingers into it as she falls asleep. It’s heavenly. She loves to be held (especially by Mom). The Special Mothers at Hannah’s Hope in Ethiopia wrote this descriptor down in her paperwork. Part of our cacooning process has been to indulge her all the time – always be there for her so she knows she can rely on us. Well, it worked. She looks for us and smiles at us and we squeeze her even tighter. 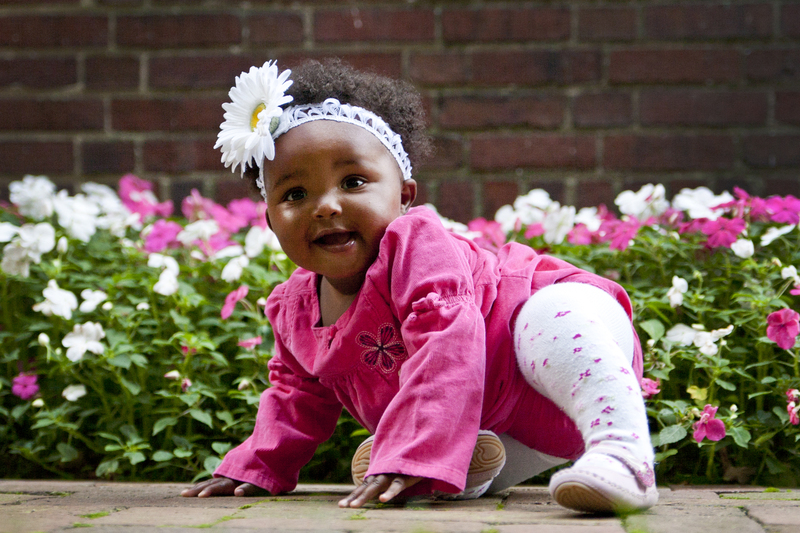 Don’t get me wrong – she has her time on the floor or in a seat, jumping and moving and rolling. But when her bursts of energy are spent, she wants to be in our arms. Our kids can’t stay away, and even though it can be a problem, it’s a good problem. Neither can we. We try to catch her gaze in the room. We talk to her and sing to her. She stops strangers in their tracks, who want to see her up close and hear our story, which we love to tell. Her sleep/eat/play cycles blend with us, and we are starting to get out and do things as a family. Thanks to all of you who made this journey with us. Your comments and emails and prayers and advice lifted us up and kept us excited, even when it seemed like our girl was a long way off. You are now part of our family too. We knelt by the window, Abby and I. As she stood on my lap gazing at the lights on the porch something in my heart stirred. She looked at the lights, she looked at me. She looked at the lights, she looked at me. Eyes full of wonder and a smile on her face…and then…she turned to me and laid her head on my shoulder and let out an “ahhh”. We sat like that for a few moments and then she popped her head back up and stared out at the lights against the dark night. As we shared this moment I just wept. You see, I couldn’t help but go back to a year ago. The season of waiting…waiting on the Lord to see our daughter. Wondering who she was, what were her circumstances, was she born, was she hungry, was her family hurting with their decision? Just before Christmas it was almost unbearable. But as I look back at that season I see so clearly why my heart was hurting. God put that there because of what she was going through. To make me look back and realize how far she has come, how far we have come. I am thankful for a God who cares, who heals. I like this new season. Seeing Abby grow and thrive. Seeing her brothers and sister love on her and the bond they have created with her. It feels like a good season. It is full of challenges but it is good. As I look back over the past year I can’t help but wonder what comes next. I am waiting as patient as I can to see God’s plan. I think about Abby here with us and my heart breaks for those left behind. God has broken my heart for the orphan and I pray every day that he reveals to me what I am supposed to do. It is hard to wait…but it is just another season. Oh, how I love the changing of the seasons. This text was copied from an email from the Joint Council of International Children’s Services. It gives a good overview on efforts for children, including domestic and international adoptions of Ethiopian children. I couldn’t find this info on their web page, but wanted to share. During the month of August, Joint Council on International Children’s Services will be hosting a delegation of Ethiopian officials in the United States. They will have the opportunity to receive training in multiple cities and witness the positive impacts that intercountry adoption has made on children from Ethiopia. The delegation will also address permanency planning including the challenges to the intercountry adoption process and solutions to those challenges to ensure the children’s best interests are served. The CIA World Factbook records that there are 5 million children having lost one or both parents in Ethiopia. Some of these children lost their parents to the effects of a severe drought followed by constant, heavy rainfall, which happened earlier this decade. In addition, 650,000 children are reported to be parentless due to AIDS. In a June 2010 study, Family Health International, under the Ethiopian Ministry of Women’s Affairs with United Nations Children’s Fund and the Children’s Investment Fund Foundation, conducted a study on institutionalized child care in Ethiopia. The study recognized that HIV and AIDS were among the primary factors contributing to the large number of children lacking parental care. Other major factors include HIV related diseases and poverty. The study found that the majority of the country, from community members to even some officials, holds a “positive perception of institutional care” for children in need and that these individuals “are not aware of the negative effects caused by institutionalization.” As a result, alternative care options, which include kinship care and foster care, have not developed at the same pace that child care institutions have. With these challenges in mind, Ethiopia has made significant strides to address them accordingly. By addressing the causes of parentless children, the Ethiopian Government works to prevent institutionalization through family preservation programs that target “parent education and family income strengthening.” Moreover, foster care has proven to be a culturally acceptable form of alternative care. Additionally, the Ministry of Women’s Affairs is emphasizing the need for family based care and working to promote an understanding for domestic adoptions. By promoting awareness, the government hopes to develop a more robust system for family permanency by developing a stronger prevalence of domestic adoptions. A positive aspect in the plight of parentless children in Ethiopia is that this country is open to intercountry adoption. Despite the recent declines in intercountry adoption globally, the number of placements from Ethiopia to the United States has increased over the last five years. In 2005, there were 442 placements in US homes, but by 2009 there were over two thousand children placed in the United States. While this number only puts a small dent in the parentless population of Ethiopia, it makes an impact in the lives of those children that were placed. 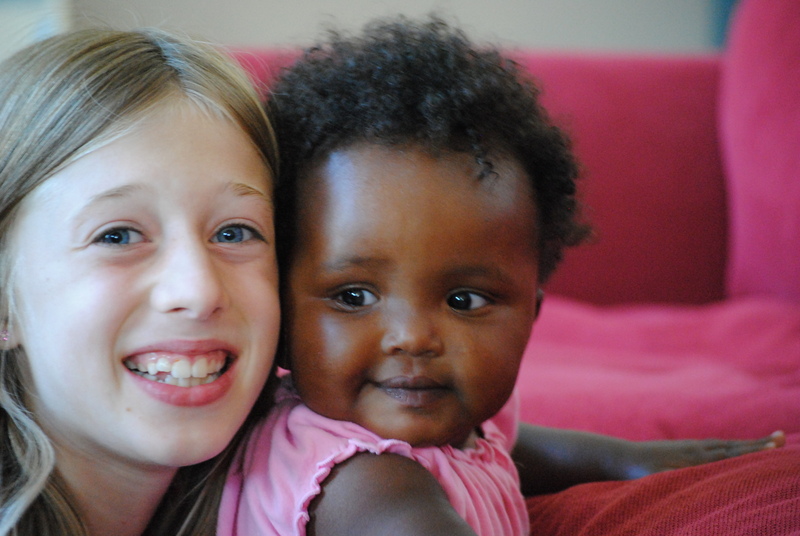 Intercountry adoption is one valuable avenue that ensures children in need live in permanent, safe, and loving families. While there is still much work to be done to provide children in Ethiopia with care, the government has demonstrated an effective commitment to mitigating the problem. “How’s everything going? How’s Abby adjusting? How are the other kids? “How is it with four kids?” Here are the standard questions I hear on a daily basis. You think I would get tired of answering again and again but…I don’t! I love telling people how we are doing. I love telling people how amazing God is in the details of our journey. I love that after all the years spent talking about adopting and staring at other adoptive families and wondering what our family would look like…we are now THAT family! Seriously, it is so surreal to me. Every night before going to bed we always check on the kids, cover them up, give them kisses. The other night after checking on the big kids I had come to Abby. 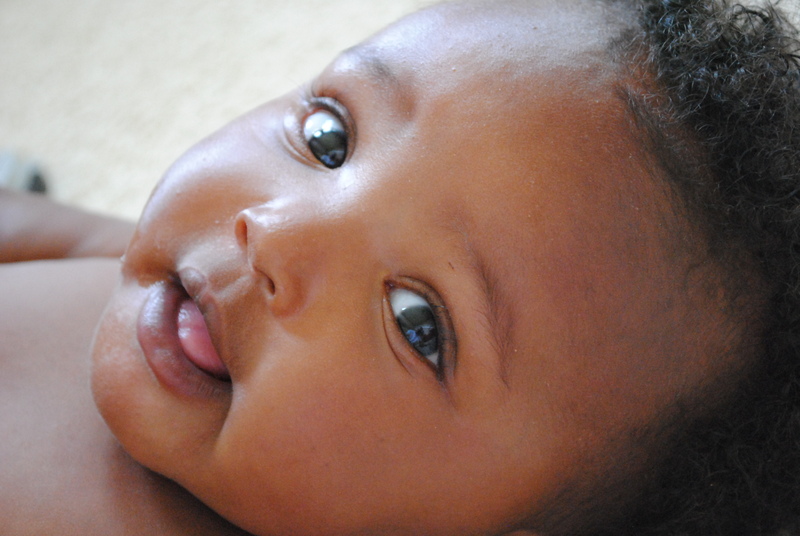 As I peered over the side of the crib at that sweet face and fuzzy hair I found myself crying. She has blessed our lives already. So many emotions come out when you have come home with your adopted child. So much joy, so much love, so much gratitude, so much that is good. But, there is this other side, the side that is so sad for her loss, so sad for her family and the sacrifice they made, so sad for all the orphans of the world wanting to find families. I am so grateful for the gift of Abby, so thankful that God chose us but I will never forget her birth family and the sacrifice her parents made. I will continue to pray for them. Wow, it has been too long since our last post so I thought I would give you a quick update. It has been almost three weeks since we arrived home with our precious Abby. We have tried to keep her home as much as possible to start creating that bond with her. We do venture out with the Baby Bjorn on and take a stroll around the block. She loves being outside. *Feedings- 6 oz bottle every 3 hours. The kids call her the “milkaholic”. That is what was written on the bib she was wearing when we saw her at Hannah’s Hope. They also laugh at the way she does her “milk dance” when she sees her bottle. She flails her arms and legs and starts smacking her lips. It is so cute. *routine- she wakes, eats, plays around then sleeps for about 30 minutes to an hour. Repeat. *Night-time- she gets up one to two times a night for a quick snack and then falls right back to sleep. I know it would be so great if she slept through the night but I don’t mind getting an extra chance to snuggle her sweetness. 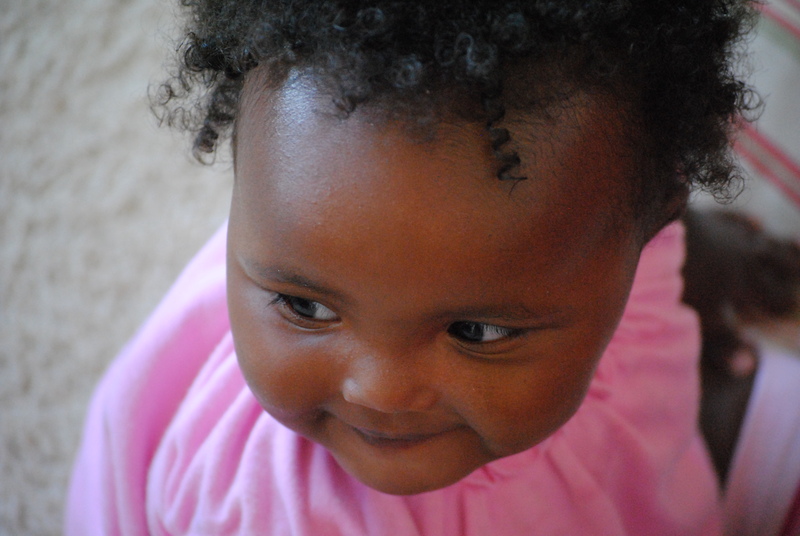 *Personality- you might be wondering if a 5 month old really has a personality, well she does and it is so fun. She is so happy and full of smiles. 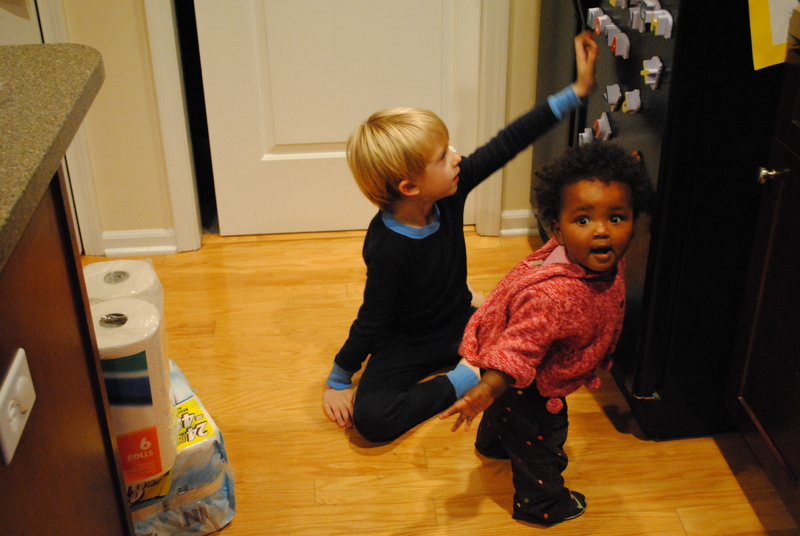 Her siblings can get her to laugh by talking to her or being silly for her. She is quite ticklish. She is now starting to really like to grab on to her toys. We are just so in awe of her sweet, fun personality. *She is teething. Not fun. Working on the bottom front teeth. I can’t wait to see that smile. *She has more chins now that we are home. Seriously, she is getting some good rolls! And those cheeks, oh my! I find that she has made me a better mom. I am cherishing all my kids in a new way. Hannah, Elliot and Logan are just amazing with Abby. They love to talk to her and get her to smile. They have grown up so much. They are so in love with their sister. It is really amazing how God knits our families together. Our journey had some bumps in it that were hard to work through at times but God has truly blessed us and I know why He called us to this place. My heart is so full of joy and I give all praise to God for what he has done. Thursday was our departure day, but we were all given the option of visiting an orphanage that many of our children came from before entering Hannah’s Hope. Everyone ended up taking the opportunity to go, so we crammed 23 little people and big people into the van and puttered our way across town. It’s amazing how your safety standards change in a different country – babies on laps, no seatbelts, adults sitting on the floor and chaotic driving. We finally pulled through the gate and unfolded ourselves from the vehicle. We ducked under rows of drying laundry and entered a playroom full of children waiting patiently at tables for their lunch. They covered a broad span of ages, from around two up to eight or nine years old. The kids were shy at first, until we started shaking hands, giving hugs, and taking pictures. Many longed for hugs and eye contact, and would take your hand and not let go. While the orphanage was smaller than Hannah’s Hope, it had its own feeling of care for children who needed help. However, you could tell that the children here were earlier on in their lives as orphans. Many had recently come to the orphanage, and some from very desperate circumstances. They took small groups at a time up to the children’s rooms because there were so many of us. While we were waiting our turn, I stood in a patio area and tried to picture what this place would be like for Abby, coming from a village area – or for older children that had a better sense that their life had significantly changed. A young man passed by, later I would find out he worked in the office there. He shook my hand and asked if I was an adoptive parent. He then thanked me, and thanked all of us, for our willingness to come here to help these children, who so desperately needed homes. I then came to meet the director of the orphanage. He seemed to be the male counterpart of Almaz. As the families came up to meet him, he remembered each child’s name and their circumstances. He hugged each of us, and asked God’s blessing on us. This was an amazing man. He was a former marketing executive who felt called by God to serve orphaned children. And while he ached for them in their need, he had the joy of a person who was doing what he should be doing, not for money but because it is the right thing to do. When Kristi came over, he took Abby in his arms and remarked at how well she looked. He said he hardly recognized her, from the state she was in when she arrived at the orphanage. This was hard for us to hear. We didn’t realize that she was in such bad shape, and to hear Almaz call her the “miracle baby,” then the orphanage director say he was amazed to see she was in such good health now, it made us realize the extent our little girl suffered in her journey to us. I went up to the rooms, but Kristi stayed behind. They were smaller than those at Hannah’s Hope, but had the same beautifully painted walls with flowers and inspirational quotes and verses. They told us that Julie from All God’s Children came and painted the rooms, and we found that Hannah’s Hope often provides resources to help improve service to the children there. The director had just taken a trip with Almaz to the southern regions of Ethiopia, to visit the government-run orphanages that first receive the children. Hannah’s Hope works closely with this orphanage to transport the children to Addis Ababa for better care. 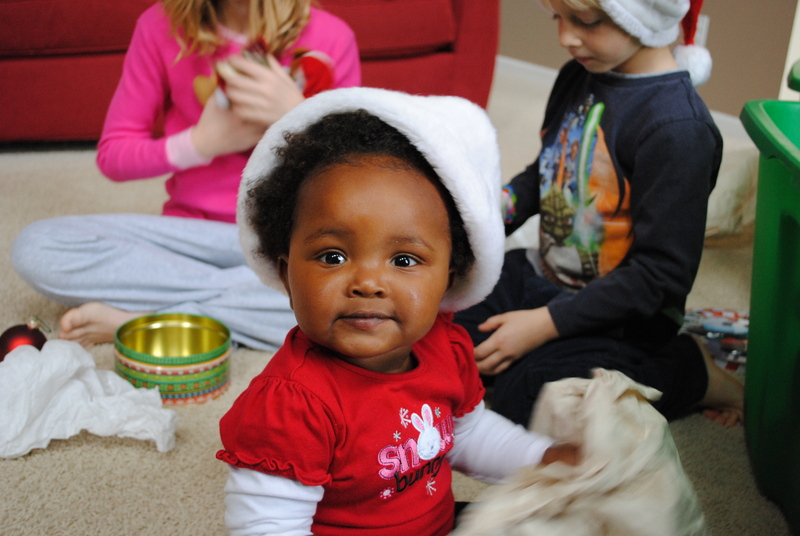 The orphanage also works with other US-based adoption agencies, including Adoption Associates, based in our hometown. It was a bitter-sweet visit, and we all felt a little heavy seeing so many orphaned children there. One of the other dads asked the director what the orphanage’s biggest need was, and he mentioned a washer and dryer set. Currently they were using the sinks in the kitchen to clean clothes, but an industrial washer and dryer would cost upwards of 5,000 US dollars. Just before we got on the bus, we collected money from anyone willing to chip in. Many of us had extra Birr that we would have to convert, and just threw it all in for the cause. In about five minutes, we collected nearly $900, and while the bus idled, a couple of us ran back in to present it to the director. In his quiet office, we prayed for him and the children at the orphanage. The remainder of the day was packing, saying goodbye, and getting our children ready for the long trip home. A few couples would leave in the next day or two, but several of us were on the same plane out of Addis. It would be the first flight heading to Europe since the volcano, and many on the flight had been stuck in Ethiopia for nearly a week. We waited in long lines at the airport, and everyone was quiet, tired, ready to go home. Abby did great on the flight, better than me in fact. The traveler’s flu finally caught up with me and I suffered through the first flight, and half way through the second before another couple offered a medicine that knocked me out, and began to knock the sickness out too. There was one last bright spot to wrap up the trip. 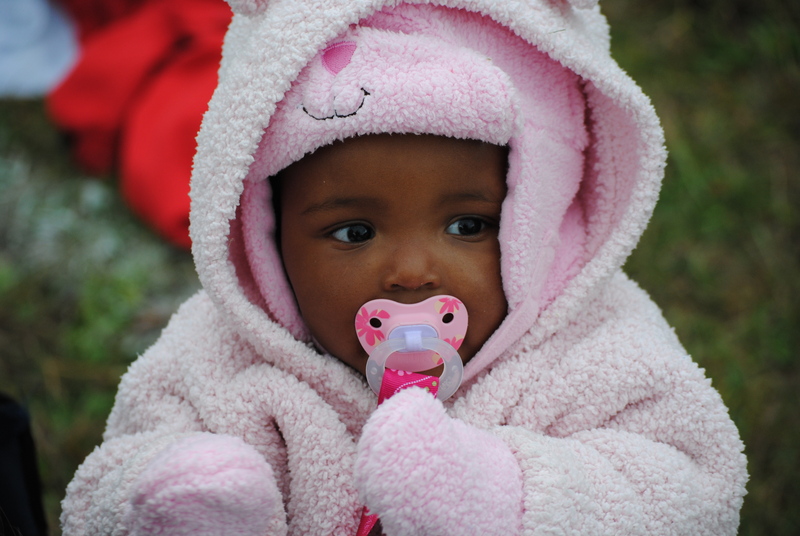 That morning, Almaz and our friends from Colorado decided they would pull their daughter from the hospital and take her home that night as originally scheduled. She was still on oxygen, but could bring a tank along on the plane in case she needed it. We were all very relieved, as the alternative would’ve been very rough on our friends. One parent would have to leave the other one behind, and hope for a quick recovery. However, tickets out would’ve been nearly impossible to secure. Almaz the day running all over the city to get the permissions to make this happen, and our friends were rushing around to get everything ready to make the flight. They were on a different airline than us, but Kristi saw them through a glass window as we went to our gate. They held up a bright-eyed girl, and pointed to a nurse who would be on the flight with them. They were all smiles. Their child was going home now. We rolled into Grand Rapids tired and excited. A huge crowd waited for us, including our kids, who all seemed a little bit older. They had decorated shirts with the African continent outlined, and Abby’s name written on them. There were balloons and flowers and hugs and kisses, just like we imagined. The first group of friends and family got to meet Abby before we went home to begin our “cocooning” process. Another group of neighbors met us outside our house with a handmade sign. At long last, our journey to adoption was now complete. We were home. She was home. Now a new journey is beginning. Every day in Ethiopia was condensed with activity and meaning, even in the small things. Wednesday was no exception. We had a late start, which meant another leisurely breakfast and coffee with the other families. The coffee in Ethiopia is fantastic. And though I still add milk and sugar to mine, those who drink it straight up affirmed that it is phenomenal to drink in-country. We loaded up our suitcases with coffee, and would later find the smell baked into our clothes. We continued to get updates on the baby that was in the hospital. She was getting good care, but not showing enough improvement to be taken home on Thursday night as planned. However, our friends were having a hard time securing any other alternative flights. We really felt for them, and were so glad Abby was back in good health when we arrived. There was one couple that we seemed to sync up with on our schedules every day, and were getting to know well. They live in Seattle, and work for a couple big, multinational companies. The mother plans to take a long break to spend time with her new daughter. They have one other boy, and when they found they could not have more children, they soon turned to adoption, and chose the agency and country the same way we did. Their new girl had lighter skin and eyes with a slightly Persian or Asian look that that gave her the nickname, “China” from our drivers. She is just a few months older than ours, and at times would reach out to grab hands with Abby, like they were friends. At noon, the busses brought us to Hannah’s Hope to meet with Almaz about our final paperwork. We took a group photo, and then entered a play room and sat in a big circle surrounded by children’s books in one corner, a seat from a car used as a bench in another corner, and Amharic letters on the wall for teaching. Almaz sat with a stack of Ethiopian passports and brown envelopes. She began by welcoming us and telling us what would happen through the rest of the paperwork and travel process. Our children would have Ethiopian passports and visas, but would become US citizens upon arrival back in our country. At that time, we would have to go through re-adoption process through our state to finalize the citizenship process. She gave us each our “golden” folder of documents that was to be opened only by immigration officers in the US. Then she took time to drill into us that it would be time, money and difficulty if we dared open the folder, intentionally or not. She then talked a bit about the status reports we would need to provide back to the Ethiopian government, and the option of sending communications to the birth family. This got into the topic of the birth families, which reminded us that each of these children had to be given up by someone. Almaz would say that it may be from the death of birth parents, disease, social stigma, or health problems – but it nearly always boiled down to issues of poverty. She got a little emotional talking about her job and how important the kids were to her. She wished there was no need for her position, and grieved for the children. She made it clear that she was there not to help parents find children, but to help children find families, and she would always be on their side first, always looking out for their best interest. Kristi and I would later talk to Almaz about the state of many children who came to Hannah’s Hope. Many were in defense mode, with little joy and little trust, and often in dangerous states of health. Most began to warm up, and open up, soon after they arrived. She remembered when Abby came in, and called her their “miracle baby,” which gave us a start because we didn’t realize how desperate her history was. Almaz hinted at some of the other things Hannah’s Hope does in Ethiopia, which we would later learn from the drivers and the director of a local orphanage. Hannah’s Hope provides resources to other orphanages, supplies to local schools, advocacy for children, and child care assistance for desperately poor working mothers. They reach beyond just the children they serve. Almaz told us about the need for a bus that could be used to transport adoptive families, and asked us to send information and quotes to AGCI in Portland. We had to take several different busses, only one of which was owned by Hannah’s Hope, and which broke down briefly on the way to the Embassy. She was a little ashamed about the $35k price tag, until we told her that regular family cars cost that much in the US. Several of us families are already talking about how to help raise the funds. If this post sounds like an advertisement for All God’s Children and Hannah’s Hope, well, that’s okay. We walked away feeling like the positive state that Abby was in when she was given to us, was in large part due to the care and support of this organization. So it was back to the hotel for a late lunch. We had to order French fries and Coca-Colas because we wanted some good starchy comfort food. The fries were great, reminiscent of In-And-Out Burger on the west coast. Perfect. That night, we would shift to purely Ethiopian food. Before we left, we pulled the couple from Colorado aside to pray for them, both for the healthy recovery of their daughter, and the strength they needed to get through this time. We also prayed that tonight would be a real celebration of new families and new hope. We had stopped by the hospital that afternoon, and sat watching the local men chewing on Chat leaves while there was another checkup on the girl, another report of improving health, but still on oxygen. Things had to improve soon. Our drivers took us to a traditional Ethiopian restaurant. The locals might consider it over the top, but for us it was a great immersion into some of the things the country is known for. The restaurant had three different levels, all facing a long, wide stage. We sat at low stools, with small round tables for four to six people to share. We washed our hands at the table, with large tin kettles that waiters poured over wide, shallow bowls. Our hosts ordered for us, and we chose our drinks. After inquiring of our drivers earlier that day, several of us decided to try “Teff,” a local honey-wine drink. We had already sampled a fine St. George’s beer in the hotel restaurant. A large plate was set out in front of the group, with a piece of injera bread covering the bottom, and rolled up pieces of injera scattered around the edges. Injera is made from teff, a grain endemic to Ethiopia. It has a spongy pancake-like texture that tastes a bit like sourdough bread. Then different foods were placed in piles around the injera, with spices in the middle. I’m not sure what everything was. Some were bean-based, some were meats, some were greens – most were spicy. Everything was delicious, and so much better than I had had at any other Ethiopian restaurant, including the hotel’s local dishes. The others would agree, including those who had been to many different ones around the US. While we ate, musicians played songs from different regions of the country, and different dancers came in for each song, dressed costumes and bringing story to the songs in large, graceful movements and colorful fabrics. At times, the dancers pulled diners into the performances, either on stage or at the tables. Our friend form Colorado did a commendable performance in a “competitive” dance with one of the professionals on stage, sweating to keep up with the changing movements and shaking shoulders that kept pace with the deep rhythms. We kept eating and drinking, not because we were hungry any more but because the food was so good. With the music, dancing, food and children around, it had the feel of a wedding reception. In this case, the celebration represented our growing families. We went home tired and full. Abby slept well that night, and so did we. Tuesday morning we loaded up in the vans to bring our kids to Hannah’s Hope. After all the talk of bonding and attachment, it seemed a little strange to be dropping our children back off at the orphanage while we hit the town. But in the end it worked out well and ensured we would get a chance to see the place our sons and daughters came from, and buy things that they would keep as mementos of their birth country. We had one of the best experiences on the van ride just before we arrived. We passed and waved to two young men, an accountant and a maintenance worker, who had just finished the night shift at Hannah’s Hope. Then, we saw a group of young women who came up to the windows as we slowed down and looked in at the children. These were the “Special Mothers,” who care for the children at Hannah’s Hope. The titles were good descriptors of their roles. They helped children who arrived in many states. This included those who had lost their parents or had been given up as unwanted or unable to be cared for. Some were sad and flat and had already begun to shut down. These Special Mothers gave them love and energy and a new life and new hope. We opened the doors of the van and the first woman reached out for Abby, calling, “Abeeeebech! Abeeeebech!” She embraced her and kissed her, as the two other Special Mothers reached out for other kids. They were a little tearful, knowing that this would be the last time they would see these babies. Abby has been at Hannah’s Hope since January 18. Since arriving, she has gained weight, improved her health, fought a bout of pneumonia – and likely formed strong bonds with several Special Mothers. It was very touching to us to see this love, and we gave them hugs and tearful thanks before Was ordered us back in the van. We saw a small bit more of Hannah’s Hope as we dropped off our kids. It took a good half hour to separate from them. The babies were being laid in one of the courtyards for their daily sun bath. We got to meet a few other Special Mothers, and recognized one of the babies as one being adopted by Kristi’s friend from the Yahoo listserv. Next it was off to the market. We had the best tour guide and host in Was, whose signature quote was, “No problem!” He could tell us about the history of Ethiopia: the fierce fighters, the oppression of the Derg, the pending elections or the culture of the Wolyatta region, where Abby is from. He talked about important people, like the owner of Pepsi-Cola in Addis, whose philanthropy supports many people and children in Ethiopia. He talked about how safe it is in Addis, where even 50 Cent recently walked the streets without being harassed, and women can walk alone at night, only fearing the occasional wild animal that finds its way into the city. At the market, we were left alone to wander and haggle among dozens of small stores, offering traditional white clothes with embroidered designs, carved wooden decorations, local coffee (coffee as a drink started in Ethiopia, and it is one of the country’s major exports), hand-made jewelry, local music. There were Rastafarian clothes and decorations (Rastafari is a religion based following former Ethiopian King Selassie as a kind of messiah, although many of the followers are in Jamaica). Street kids selling gum would occasionally wander up, although they were soon chased away by women with large sticks employed by the city, and tipped by our drivers to keep beggars at bay. Everyone wanted to show us their unique wares, but none were overly aggressive. One proprietor called me into his store, no bigger than an elevator, to show me something special. He pulled out a book with wooden covers and pages that looked old but had some kind of laminate on them. It was a Bible in Amharic, with ancient pictures from medieval times. I thought it was great, even if it probably was not the aged, priceless artifact from Lalibela or Axum that he claimed. Two hundred Birr (14 Birr to 1 Dollar) sounded like a great deal, until I realized he wanted two hundred US Dollars. After much pleading on his part and offering cheaper alternatives, I had to move on. We did a bit of haggling on our purchases, but easily gave in because it all seemed like good deals to us, and profits going to good people who need them. We had lunch at an Italian restaurant as a group. The Italians ruled over Ethiopia for around four years, but were pushed out after an overwhelming defeat at the Battle of Adwa. As a result, Ethiopia is the only African country not to be colonized. Italy did not leave behind its language or major parts of its culture, but you can get a good cappuccino in Addis, and a great Italian meal. There were beautiful paintings at the restaurant, all for sale. We couldn’t find just the right one for us, but took some pictures of a few of the most beautiful. A man working there asked Kristi about our adoption, and thanked us for caring enough about Ethiopia and the children to be willing to raise them as our own. He wouldn’t be the first person to thank our group. I talked to a couple in our group from Minneapolis. They are adopting a little boy who is nearly two. The dad is an orthopedic resident at the Mayo Clinic, and they have a good personal and professional network of doctors and specialists who they call friends. Because of this, they felt they could take on their boy, who is a little undeveloped for his age, possibly from malnutrition, but shows good promise now that he will have the resources of a great family with lots of love. 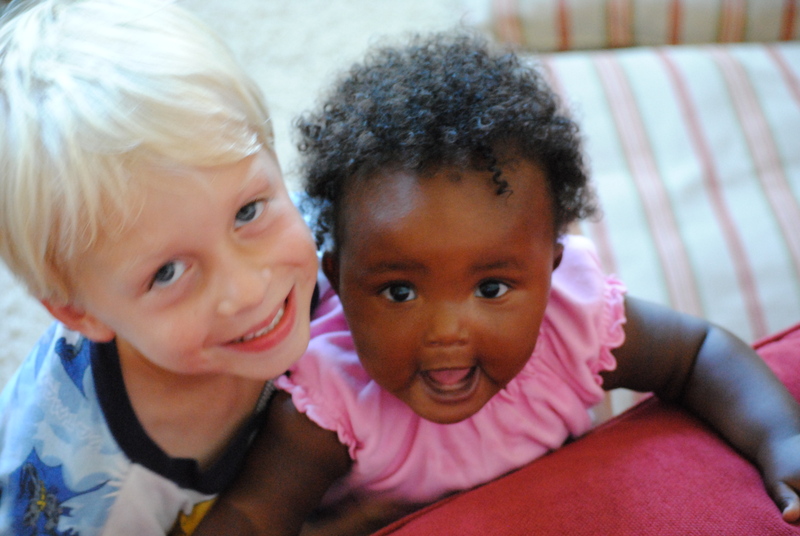 They have three other children, including one who was adopted domestically, and has the same skin color as their son. 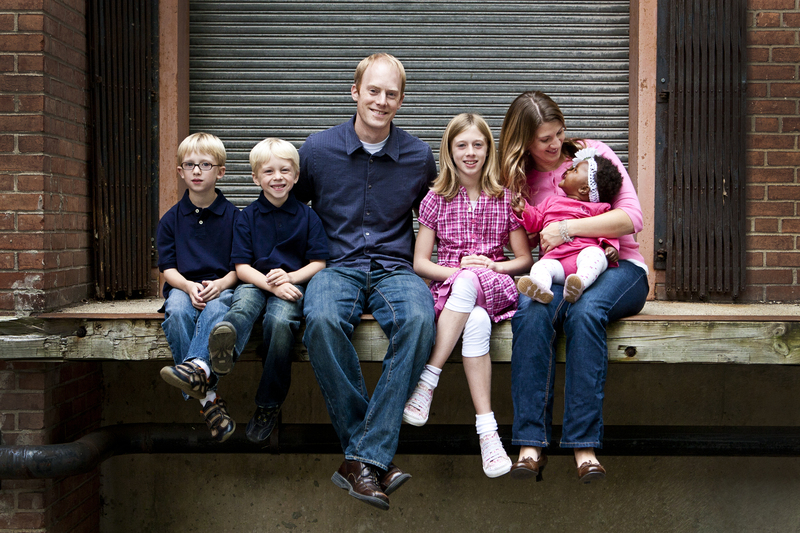 They had a very similar adoption journey in how they came to choose Ethiopia and All God’s Children. Being there, we all felt good about our decisions. Back at Hannah’s Hope, we were reunited with Abby and had some time to explore the infant area. Hannah’s Hope recently moved into a new building. The two joined homes were owned by brothers who must’ve been very wealthy, because they are more like two mansions (even by US standards), converted into rooms for children. They showed us Abby’s crib, which was next to a window on the second story, looking out over the city. The walls were pink, with flowers painted on. In fact, all rooms are bright and colorful, everything is clean and organized, and while the rooms are full of children, there are plenty of other areas to play and sit. It is a special, happy place where children find healing and hope for a new future. They had bathed, lotioned and changed Abby into a new set of clothes for us. We finally returned to the hotel, where we ate and napped and spent the remainder of the day. Abby woke up looking a little perplexed at seeing us again. But she quickly relaxed. She is a very content and happy girl, who has her own cycles of eating, playing, sleeping, and repeating. The hotel phones are not easy to use, and expensive, but we were able to talk to the kids both Monday and Tuesday night. We’ve had some great support at home, with family, friends and neighbors shuttling kids around to school, preschool, soccer, music, and play dates. They all seem to be doing well and having a good time in these special circumstances. But I suspect there are times when they miss us as much as we miss them, and we look forward to sharing these experiences with them. It was another beautiful day in Ethiopia, and there was a light rain that evening. The kids still practiced soccer in the field across the street. The restaurant was still full of adoptive families and world travelers, and we were still finding a smooth transition to being an adoptive family. We were still basking in the glow of our new children as we raced across town for our Embassy appointments. We piled out and went through two layers of security, giving up our cameras and cell phones. We waited on benches with Ethiopians applying for working visas, student visas and other transactions with our government. Then we were called through to wait in another line, while they called our names, one at a time. While we waited, we hung out with our kids in a shady courtyard with white flowers and a small lawn that was being cut by a maintenance worker with a pair of hedge trimmers. 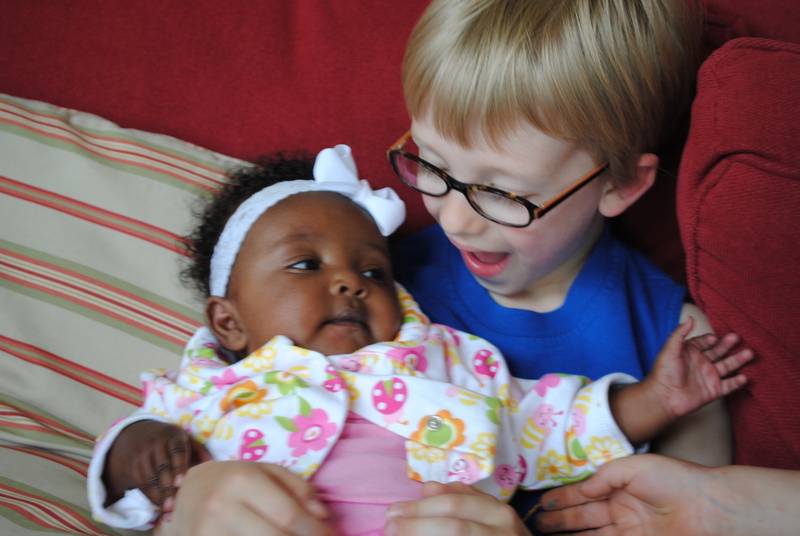 We learned a bit more about the couple from Colorado, who were adopting a baby girl. This was a rough trip for them, as their daughter is in the hospital with pneumonia, so they are unsure when they can take her home. She was brought to the Embassy appointment with an i.v. still in her arm, and looking a little unhappy. They had not had a chance to really take over care of their daughter, and continue to be in a holding pattern. He works as a commercial real estate developer, and she was a teacher, before having four kids. She taught for ten years in South Central Los Angeles, so has a patience and understanding beyond most parents. I found out that he went to the same college as me – Vanguard University of Southern California (called Southern California College in our time), and graduated several years before me. They have four other kids and really wanted to adopt to add on and care for another child who doesn’t have a family. Their patience, trust and faith have been inspirational to all of us, and we can’t help but feel for them while they travel with us to our different events and appointments, but without their girl in their arms. The Embassy appointment was a lot of buildup for a two-minute interview across a plexiglass window. We were told that the adoption will be final, we raised our right hand and swore that the information in the documents was truthful. We vouched for the agency, that they had not given us a different child than was referred to us. We were asked what we know about the birth parents. The woman at the window was from Rochester, Michigan, and very friendly. She told us the Ethiopian passport would be ready in a couple of days (the agency would pick it up) and that we would need to do a re-adopt process in Michigan. Abby slept as we drove back through Addis Ababa, taking in the palace, the university, the National Museum, home of Lucy. We saw donkeys and goats, Mercedes cars and Suzuki trucks. We saw Somali refugees and Muslims in burkas. We saw students in uniforms and colorful fruit stands. Back at the hotel, we spent the rest of the day with our girl. We had a family nap together, we ate lunch and dinner in the hotel restaurant, with other families that would come and go. We tried some Doro Wat – very spicy Ethiopian food – with injera bread (made from teff, a grain endemic to Ethiopia). We watched kids in the field across the street in a three-hour soccer practice that only ended when it was pitch-black outside, and would resume the next day in the rain. We inspected Abby’s hands and feet and belly and cheeks. We just hung out and enjoyed being new parents again.